Close view of the Delhi Gateway, Aurangabad. bl.uk > Online Gallery Home	> Online exhibitions	> Asia, Pacific and Africa Collections	> Close view of the Delhi Gateway, Aurangabad. 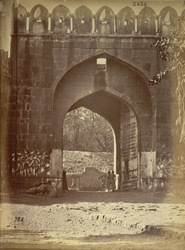 Photograph of the Delhi gateway in Aurangabad in Maharashtra, from the Archaeological Survey of India Collections, taken by Henry Mack Nepean in 1868. Aurangabad is situated on the Khan river in the Dudhana valley between the Lakenvara Hills and the Sathara range. Originally known as Khadke, Aurangabad city was founded in the early 17th century by Malik Amber, minister of the Nizam Shah Kings of Ahmadnagar. However, in 1637 the city was incorporated in the Mughal empire, and in 1653 Prince Aurangzeb became Viceroy of the Deccan. In 1681-2 the Mughal Emperor Aurangzeb (r.1658-1707) moved his court to Aurangabad and used it as the base for his military campaigns in the Deccan. After Aurangzib's death in 1707 the city was renamed in his honour. The city walls were built by Aurangzeb in 1682, designed to deter Maratha attacks. There were nine smaller gates and four principle gates: the Delhi Gate on the north; Jalna on the east; Pathan on the south; and Mecca on the west. This view shows the machicolated merlons above the gateway.